The extraordinary thing is that Cherchen Man was found – with the mummies of three women and a baby – in a burial site thousands of miles to the east of where the Celts established their biggest settlements in France and the British Isles. DNA testing confirms that he and hundreds of other mummies found in Xinjiang’s Tarim Basin are of European origin. We don’t know how he got there, what brought him there, or how long he and his kind lived there for. But, as the desert’s name suggests, it is certain that he never came out. His discovery provides an unexpected connection between east and west and some valuable clues to early European history. One of the women who shared a tomb with Cherchen Man has light brown hair which looks as if it was brushed and braided for her funeral only yesterday. Her face is painted with curling designs, and her striking red burial gown has lost none of its lustre during the three millenniums that this tall, fine-featured woman has been lying beneath the sand of the Northern Silk Road. The bodies are far better preserved than the Egyptian mummies, and it is sad to see the infants on display; to see how the baby was wrapped in a beautiful brown cloth tied with red and blue cord, then a blue stone placed on each eye. Beside it was a baby’s milk bottle with a teat, made from a sheep’s udder. Based on the mummy, the museum has reconstructed what Cherchen Man would have looked like and how he lived. The similarities to the traditional Bronze Age Celts are uncanny, and analysis has shown that the weave of the cloth is the same as that of those found on the bodies of salt miners in Austria from 1300 BC. At their peak, around 300 BC, the influence of the Celts stretched from Ireland in the west to the south of Spain and across to Italy’s Po Valley, and probably extended to parts of Poland and Ukraine and the central plain of Turkey in the east. These mummies seem to suggest, however, that the Celts penetrated well into central Asia, nearly making it as far as Tibet. The Celts gradually infiltrated Britain between about 500 and 100 BC. There was probably never anything like an organised Celtic invasion: they arrived at different times, and are considered a group of peoples loosely connected by similar language, religion, and cultural expression. The eastern Celts spoke a now-dead language called Tocharian [but Dienekes says we can’t assume this was so], which is related to Celtic languages and part of the Indo-European group. They seem to have been a peaceful folk, as there are few weapons among the Cherchen find and there is little evidence of a caste system. The Taklamakan desert has given up hundreds of desiccated corpses in the past 25 years, and archaeologists say the discoveries in the Tarim Basin are some of the most significant finds in the past quarter of a century. “From around 1800 BC, the earliest mummies in the Tarim Basin were exclusively Caucausoid, or Europoid,” says Professor Victor Mair of Pennsylvania University, who has been captivated by the mummies since he spotted them partially obscured in a back room in the old museum in 1988. “He looked like my brother Dave sleeping there, and that’s what really got me. Lying there with his eyes closed,” Professor Mair said. It’s a subject that exercises him and he has gone to extraordinary lengths, dodging difficult political issues, to gain further knowledge of these remarkable people. East Asian migrants arrived in the eastern portions of the Tarim Basin about 3,000 years ago, Professor Mair says, while the Uighur peoples arrived after the collapse of the Orkon Uighur Kingdom, based in modern-day Mongolia, around the year 842. A believer in the “inter-relatedness of all human communities”, Professor Mair resists attempts to impose a theory of a single people arriving in Xinjiang, and believes rather that the early Europeans headed in different directions, some travelling west to become the Celts in Britain and Ireland, others taking a northern route to become the Germanic tribes, and then another offshoot heading east and ending up in Xinjiang. This section of the ancient Silk Road is one of the world’s most barren precincts. You are further away from the sea here than at any other place, and you can feel it. This where China tests its nuclear weapons. Labour camps are scattered all around – who would try to escape? But the remoteness has worked to the archaeologists’ advantage. The ancient corpses have avoided decay because the Tarim Basin is so dry, with alkaline soils. Scientists have been able to glean information about many aspects of our Bronze Age forebears from the mummies, from their physical make-up to information about how they buried their dead, what tools they used and what clothes they wore. In her book The Mummies of Urumchi, the textile expert Elizabeth Wayland Barber examines the tartan-style cloth, and reckons it can be traced back to Anatolia and the Caucasus, the steppe area north of the Black Sea. Her theory is that this group divided, starting in the Caucasus and then splitting, one group going west and another east. Even though they have been dead for thousands of years, every perfectly preserved fibre of the mummies’ make-up has been relentlessly politicised. The received wisdom in China says that two hundred years before the birth of Christ, China’s emperor Wu Di sent an ambassador to the west to establish an alliance against the marauding Huns, then based in Mongolia. The route across Asia that the emissary, Zhang Qian, took eventually became the Silk Road to Europe. Hundreds of years later Marco Polo came, and the opening up of China began. The very thought that Caucasians were settled in a part of China thousands of years before Wu Di’s early contacts with the west and Marco Polo’s travels has enormous political ramifications. And that these Europeans should have been in restive Xinjiang hundreds of years before East Asians is explosive. The Chinese historian Ji Xianlin, writing a preface to Ancient Corpses of Xinjiang by the Chinese archaeologist Wang Binghua, translated by Professor Mair, says China “supported and admired” research by foreign experts into the mummies. “However, within China a small group of ethnic separatists have taken advantage of this opportunity to stir up trouble and are acting like buffoons. Some of them have even styled themselves the descendants of these ancient ‘white people’ with the aim of dividing the motherland. But these perverse acts will not succeed,” Ji wrote. Many Uighurs consider the Han Chinese as invaders. The territory was annexed by China in 1955, and the Xinjiang Uighur Autonomous Region established, and there have been numerous incidents of unrest over the years. In 1997 in the northern city of Yining there were riots by Muslim separatists and Chinese security forces cracked down, with nine deaths. There are occasional outbursts, and the region remains very heavily policed. Not surprisingly, the government has been slow to publicise these valuable historical finds for fear of fuelling separatist currents in Xinjiang. Professor Mair acknowledges that the political dimension to all this has made his work difficult, but says that the research shows that the people of Xinjiang are a dizzying mixture. “They tend to mix as you enter the Han Dynasty. By that time the East Asian component is very noticeable,” he says. “Modern DNA and ancient DNA show that Uighurs, Kazaks, Kyrgyzs, the peoples of central Asia are all mixed Caucasian and East Asian. The modern and ancient DNA tell the same story,” he says. Altogether there are 400 mummies in various degrees of desiccation and decomposition, including the prominent Han Chinese warrior Zhang Xiong and other Uighur mummies, and thousands of skulls. The mummies will keep the scientists busy for a long time. Only a handful of the better-preserved ones are on display in the impressive new Xinjiang museum. Work began in 1999, but was stopped in 2002 after a corruption scandal and the jailing of a former director for involvement in the theft of antiques. The museum finally opened on the 50th anniversary of China’s annexation of the restive region, and the mummies are housed in glass display cases (which were sealed with what looked like Sellotape) in a multi-media wing. In the same room are the much more recent Han mummies – equally interesting, but rendering the display confusing, as it groups all the mummies closely together. Which makes sound political sense. This political correctness continues in another section of the museum dedicated to the achievements of the Chinese revolution, and boasts artefacts from the Anti-Japanese War (1931-1945). Best preserved of all the corpses is Yingpan Man, known as the Handsome Man, a 2,000-year-old Caucasian mummy discovered in 1995. He had a gold foil death mask – a Greek tradition – covering his blond, bearded face, and wore elaborate golden embroidered red and maroon wool garments with images of fighting Greeks or Romans. The hemp mask is painted with a soft smile and the thin moustache of a dandy. Currently on display at a museum in Tokyo, the handsome Yingpan man was two metres tall (six feet six inches), and pushing 30 when he died. His head rests on a pillow in the shape of a crowing cockerel. 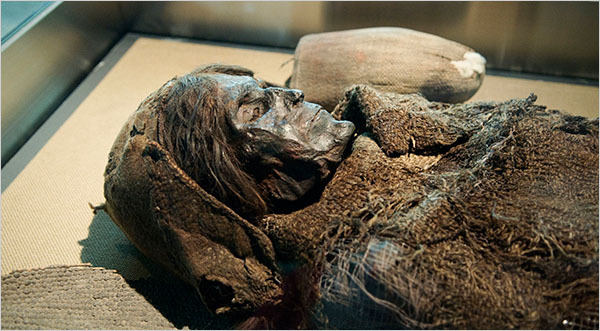 The mummy known as the Loulan Beauty on display at a museum in Urumqi, China. URUMQI, China — An exhibit on the first floor of the museum here gives the government’s unambiguous take on the history of this border region: “Xinjiang has been an inalienable part of the territory of China,” says one prominent sign. Mummies in western China have revealed ancient migration patterns. But walk upstairs to the second floor, and the ancient corpses on display seem to tell a different story. One called the Loulan Beauty lies on her back with her shoulder-length hair matted down, her lips pursed in death, her high cheekbones and long nose the most obvious signs that she is not what one thinks of as Chinese. Some Uighurs have latched on to the fact that the oldest mummies are most likely from the west as evidence that Xinjiang has belonged to the Uighurs throughout history. A modern, nationalistic pop song praising the Loulan Beauty has even become popular. Scholars generally agree that Uighurs did not migrate to what is now Xinjiang from Central Asia until the 10th century. But, uncomfortably for the Chinese authorities, evidence from the mummies also offers a far more nuanced history of settlement than the official Chinese version. By that official account, Zhang Qian, a general of the Han dynasty, led a military expedition to Xinjiang in the second century B.C. His presence is often cited by the ethnic Han Chinese when making historical claims to the region. The mummies show, though, that humans entered the region thousands of years earlier, and almost certainly from the west. Four are in glass display cases in the main museum here in Urumqi, the regional capital. Their skin is parched and blackened from the wear and tear of thousands of years, but their bodies are strikingly intact, preserved by the dry climate of the western desert. Some foreign scholars say the Chinese government, eager to assert a narrative of longtime Chinese dominance of Xinjiang, is unwilling to face the fact that the mummies provide evidence of heterogeneity throughout the region’s history of human settlement. As a result, they say, the government has been unwilling to give broad access to foreign scientists to conduct genetic tests on the mummies. “In terms of advanced scientific research on the mummies, it’s just not happening,” said Victor H. Mair, a professor of Chinese language and literature at the University of Pennsylvania who has been at the forefront of foreign scholarship of the mummies. Mr. Mair first spotted one of the mummies, a red-haired corpse called the Cherchen Man, in the back room of a museum in Urumqi while leading a tour of Americans there in 1988, the first year the mummies were put on display. Since then, he says that he has been obsessed with pinpointing the origins of the mummies, intent on proving a theory dear to him: that the movement of peoples throughout history is far more common than previously thought. But a Chinese researcher managed to slip a half-dozen vials to Mr. Mair. From those samples, an Italian geneticist concluded in 1995 that at least two of the mummies had a European genetic marker. The Chinese government in recent years has allowed genetic research on the mummies to be conducted only by Chinese scientists. Jin Li, a well-known geneticist at Fudan University in Shanghai, tested the mummies in conjunction with a 2007 National Geographic documentary. He concluded that some of the oldest mummies had East Asian and even South Asian markers, though the documentary said further testing needed to be done. Mr. Mair has disputed any suggestion that the mummies were from East Asia. He believes that East Asian migrants did not appear in the Tarim Basin until much later than the Loulan Beauty and her people. The oldest mummies, he says, were probably Tocharians, herders who traveled eastward across the Central Asian steppes and whose language belonged to the Indo-European family. A second wave of migrants came from what is now Iran. The theory that the earliest mummies came from the west of what is now modern China is supported by other scholars as well. A textile expert, Elizabeth Wayland Barber, in a book called “The Mummies of Urumchi,” wrote that the kind of cloth discovered in the oldest grave sites can be traced to the Caucasus. Han Kangxin, a physical anthropologist, has also concluded that the earliest settlers were not Asians. He has studied the skulls of the mummies, and says that genetic tests can be unreliable. “It’s very clear that these are of Europoid or Caucasoid origins,” Mr. Han, now retired, said in an interview in his apartment in Beijing. Of the hundreds of mummies discovered, there are some that are East Asian, but they are not as ancient as the Loulan Beauty or the Cherchen Man. The most prominent Chinese grave sites were discovered at a place called Astana, believed to be a former military outpost. 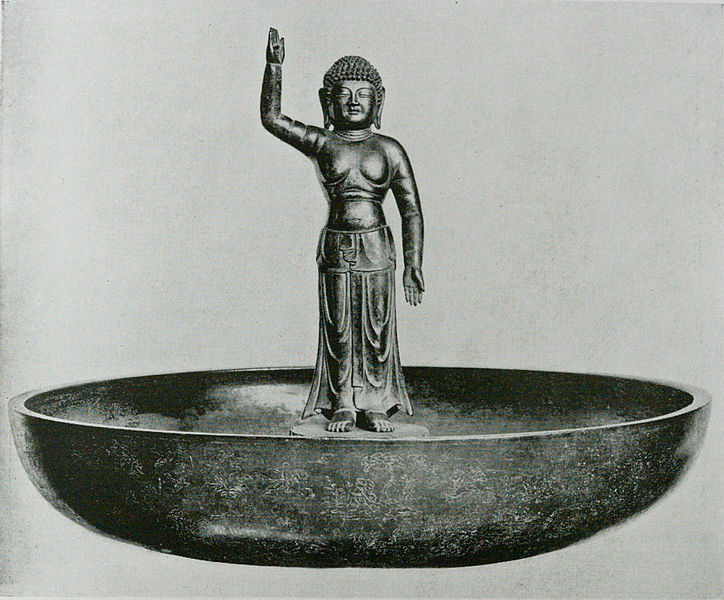 The findings at the site span the Jin to the Tang dynasties, from the third to the 10th centuries. Further clouding the picture, a mummy from the Lop Nur area, the 2,000-year-old Yingpan Man, was unearthed with artifacts associated with an entirely different part of the globe. He was wearing a hemp death mask with gold foil and a red robe decorated with naked angelic figures and antelopes — all hallmarks of a Hellenistic civilization. Despite the political issues, excavations of the grave sites are continuing. Mr. Abuduresula, the Uighur archaeologist, made a trip in late September to the desert site at Xiaohe, where 350 graves have been discovered. The bottom layer of graves dates back nearly 4,000 years. More recent graves point to a matriarchal herding society that worshiped cows, Mr. Abuduresula said. Somewhere in those sands, he said, archaeologists have discovered a woman as striking as the Loulan Beauty. She is called the Xiaohe Princess, and even her eyelashes are intact. An article on Nov. 19 about non-Chinese mummies discovered in the Tarim Basin of China’s Xinjiang Uighur Autonomous Region misstated the dynasty that ruled China from the early 7th century to the early 10th century, part of the period reflected in the discovery of Chinese grave sites at a Xinjiang location called Astana. It was the Tang, not the Han. Colin Renfrew is the former Disney professor of Archaeology and Director of the McDonald Institute for Archaeological Research at the University of Cambridge, Cambridge, UK. He is now Senior Fellow of the McDonald Institute. He is famous for his Anatolian Hypothesis which departed from Gimbutas’ Kurgan hypothesis.